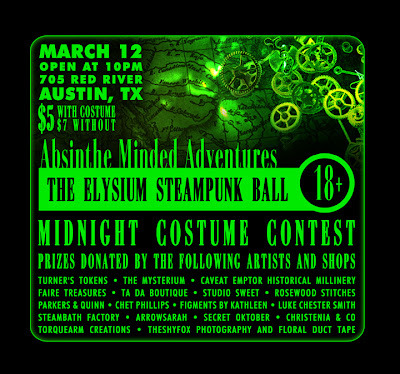 The first featured donation comes from Austin’s The Mysterium, a Steampunk shop located in South Austin. 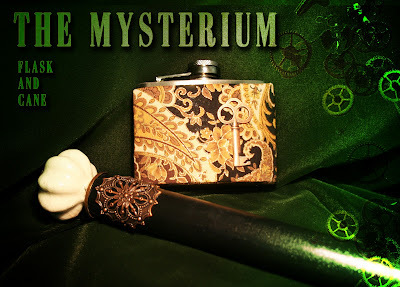 This is a cane with a matching flask perfect for any Victorian on their adventures through the Æther. Are you missing those last few pieces that really top off your outfit? Stop by The Mysterium, Austin’s only Steampunk store located at the Community Renaissance Market in South Austin. They carry a wide variety of local artist pieces, crafting supplies and owner crafted pieces. If you are looking to buy completed piece or are working to modify some of your own, stop by and check out their inventory. Items are also available for sale online with payment through PayPal. They are currently running a promotion for when they hit 300 facebook fans. They will hold a drawing for one of their canes; stop by and join in before the drawing is held!